TRADER 9: Trade of the day, GLUU!!! So from yesterday I sold OCZ this morning at 1.64 when I realized there was a lot of seller pressure after it touched 1.70. Now GLUU pop-up on my radar right at the open and I looked at the support levels from the past, and saw it had a strong support level that goes back almost a year ago on 11/21/11 were it hit a low of 2.55. I noticed it tested that support on the 1-minute chart, so I quickly bought 2000 shares at 2.59 and place my stop at 2.54 hoping to catch a decent bounce. 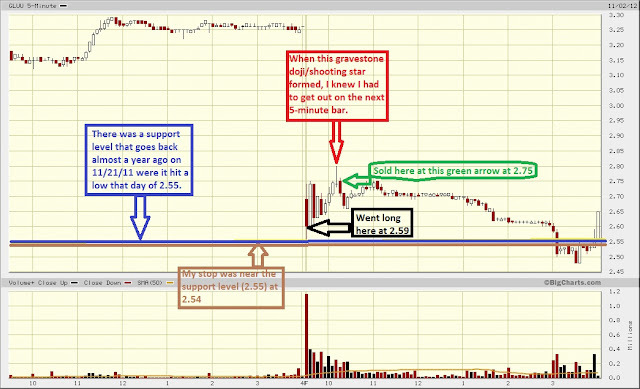 It broke through the intraday high of 2.75, but formed a gravestone doji. I knew I had to get out on the next 5-minute bar because that candlestick pretty much told me it wasn't going any higher than that today. Exited the trade at 2.75 for a .16 point profit. If you want to see what I might be trading during market hours and interact with me during my trading days, just follow me on twitter @tradermike9. Well anyways, have a great weekend and I'll be back posting another trade on Monday.